i bought a new "ir led" for my raspberry noir camera. I cant find how many volts need run of this leds. But I have to make sure that it is not dangerous for raspberry or this LEDs. Would that be any damage with this connections? You really should be driving your LEDs with a separate power supply. Use the GPIO pin (max 16mA) to switch a BPJ or MOSFET transistor. Use the transistor to switch your 3V 1000mA supply for your LED. I have some LEDs that look the same as those (they may not be identical). They run fine from the 3.3V supply pins. My point was that a 3V, 1A (3W) LED can't be driven from a 16mA GPIO, it can be switched with a GPIO. If you drive that load for long enough you'll let the magic blue smoke out of your Raspberry and it WILL die. Dougie, why don't you read what OP wrote rather than jumping to the wrong answer ! However, the 3v3 supply from the GPIO pins is not designed to provide the level of current your LEDs require. They may be working, but your PI may become unreliable due to the 3V3 supply being over loaded. Last edited by PeterO on Sat Sep 30, 2017 10:19 am, edited 1 time in total. No one even suggested driving it from a 16 mA GPIO pin. BCM #1 and BCM #17 are GPIos on all of my Raspberries. The problem is the OP wasn't clear he/she was using physical numbering. How the RPF ever got to three pin numbering schemes is one of the world's great mysteries. Reading what other people wrote has never been one of Dougie's strong points. The OP wrote "raspberry 3.3volt pins(pin no:1 and 17) and i connect other leg ground(pin no:9 and 39)". A glance at any of the GPIO layout diagrams makes it obvious that the OP is referring to the power rails, not GPIOs on the Broadcom chip. 3 watts is almost 1 amp from a 3.3 volt rail. You can't take 2 amps or anything close to that from the 3.3 volt regulator on a RPi. you can only take something like 0.1A from the 3V3 regulator on the PI, so powering a 1A power LED from it is totally out of the question, and will damage your PI. Also, don't forget that *all* LED's needs a current limiting resistor you have to add yourself (unless its built in, like for example with some self-blinking LED's is the case, and also with this light controlled LED). calculate the resistors value as R=V/I (Power_Voltage - LED_forward_Voltage)/LED_Current. So for example a blue (3 Volt) LED needing 10mA on a 5V supply needs a ( 5.0 V - 3.0 V ) = 2.0 Volt / 0.01 A = 200 Ohms resistor. Nearest "normal value" (E12 Range, with 12 values per decade) = 220 Ohm. Make sure the dissipation in the resistor is sufficiently low for the resistor, in this case P = U x I = 2 Volt * 0.01A = 0.02 Watt (20 milliwatt) so a quarter watt resistor is fine. That may not be true when you are limiting one ampere. 2 Volt * 1 Ampere = 2 Watt, so your 1/4 Watt resistor will start to smoke and burn up. Look at the item linked to in the first post. It isn't just a LED. No extra resistor is required or even advisable. True in this case the current limiting resistor is built in, that is why I said there were exceptions, this one is such an exception. Not everyone who reads posts like this will realise that, and later might remember someone talking about powering a LED from just a voltage source, and make the wrong conclusion that that is fine to do so! So its advisable to once again explain that any LED needs a current limiting device, so that they will not try to just power a LED without thinking about the need for current limitation. Time and time again I see people making such a mistake, often with dire consequences. but yes, in this case the "3W 850nm LED" has it built in..... I post edited my previous post somewhat to make this more clear. By the way it is typical for resellers like this that they don't even mention on which voltage this device is intended to operate, but like I said it cannot be intended to be operated from the 3.3Volt supply, as for a 3W device it would indeed draw almost an ampere from the 3.3V supply. On second thought, I can see that these LED's are meant to be directly screwed to a raspberry PI camera board, so in that case the voltage and polarity is fixed anyway. Problem with that is that AFAIK raspberry PI cams do not have any voltages on the four mounting holes this LED is supposed to be mounted to, so you probably have to also buy an aftermarket camera with it, and I have seen two of these LED's mounted on either side of what seems to be a fake cam, meaning they power it with 2A and 3V3, (the only power voltage available on the camera module) which is ridiculous as 2A cannot be supplied by any PI on the 3V3 line, and besides 2A through the single 3V3 pin of the FPC camera cable would fry the connector, so these cannot ever be 3W LED's, the plot thickens. Uhmm first thanks for all answers.but I am completely confused. I do not know too much electronics, really sorry for this. Just I need someone has should say to me ; "you are using it wrong" or "you can use it like this"
but someone tell me "you are using is wrong" i have one more questions? What exactly do I need to buy (transistor, resistor or etc.) for using this. * And i dont know maybe this leds have included necessary electronic components.. Maybe not. anyhow could you pls measure the current they take ( at 3v3 )? so the " 3W 1A " question can be verified. also with above photograph, I can now say something about the polarity of the 3.3V connection. the bottom left screw connection is clearly connected to the groundplace of the LED board, so that screw contact represents GND, and the other one then represents 3.3V, do not exchange them or you will destroy the board. If you are using the original PI camera I'm afraid you need to get your soldering iron out, as its the only way to connect GND and 3.3V to the screw pads, as they are not designed for these LED's and are electrically isolated. I don't think the 3Watt claim can be true at all, with the PI (any PI) you can only draw a few hundred mA extra from the 3V3 supply, before burning it up, so each LED can draw at most 100mA, which if I assume the LED's are 3Volt, gives you 0.3Watt for the LED's. Be careful to not turn the brightness (current consumption) up too much, or you will burn up the 3V3 supply of the PI, which will destroy the PI. I have a different opinion. I think all four of the nuts and bolts that connect the two LED board to the camera board are ground. Each board has one other external connection - the terminal with the cross-head screw. Those two terminals should be wired together and to a positive supply voltage. What voltage? Maybe 5 volts, maybe 3.3 but I would hesitate to connect to a 3.3 volt pin on the RPi GPIO header. I would also consider running a ground wire to one of the 4 nuts so as not to have the LED currents flowing in the thin ground conductor(s) of the camera cable. Last edited by drgeoff on Sun Oct 01, 2017 3:31 pm, edited 1 time in total. I have a different opinion. I think all four of the nuts and bolts that connect the two LED board to the camera board are ground. Each board has one other external connection - the terminal with the cross-head screw. Those two terminals should be wired together and to a positive supply voltage. What voltage? Maybe 5 volts, maybe 3.3 but I would hesitate to connect to a 3.3 volt pin on the RPi GPIO header. I have some LED boards looking exactly the same as these, but a lower wattage. The two holes are the + and - supply lines. The think I think you're referring to as a cross-head screw is a small variable resistor which I think controls the sensitivity of the light sensor. Not sure which holes you are referring to, but having had another look at the picture I concede that the cross-head "screws" are much more likely to be variable resistors. Ah, the ones with the bolts through them. Cross head screw? Are you looking at what look to me like sensitivity adjustment potentiometers? The two LED board look identical with rotated 180° relative to the other. If the mounting holes with nut and bolt fitted are also power connections then like polarity connections are diagonally opposite pairs. 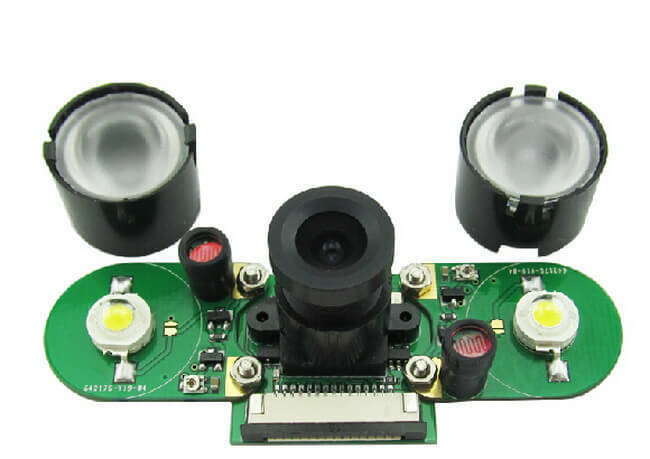 Aliexpress wrote: Limited by the Raspberry Pi power supply, the 3W high-power infrared LED might cause the Pi to increase heating, heat sinks are suggested. Feeback suggests it isn't 3W and if it draws power from the camera module it can't be. The standard flat flex cable (FFC) surely can't carry an amp and the connectors won't be up to that either. I bet a fair fraction of a volt is dropped over the connections and the current is modest. It may light but won't be that bright. Best bet is to use a separate 5W 3V power supply and connect it directly, once you work out where -ve and -ve terminals are. Unfortunately, I do not have a device to measure it.